Fitness software is the latest trend in exercise, and Sam Luciano, owner of Spartan Fitness Products, is here to answer our questions and give us the inside scoop on the benefits of this new technology. 1. "Fitness software" sounds like an oxymoron. How does it work? 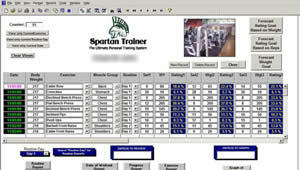 Spartan Fitness Products has two types of software systems. One is web based and works from either internet based PCs or most mobile devices including the iPhone, iPad, Droid. etc. The other is just PC based but offers more modules and features. We also sell a private line of fitness supplements and a high level line of fitness equipment which we manufacture right here in Queensbury and shipped worldwide. This one site gives fitness enthusiasts one-stop shopping for most of their fitness needs. 2. Are there any other sites/software like this out there? What sets you apart from the others? Yes, there are other sites that promote software that records your workouts. Two things set us apart from the competition: one is the web-based application, and the other is our rating system. Each set of each exercise is rated and given a numerical value. This value is based on: weight, reps, body weight, and muscle fiber. This rating system allows you to clearly see results or routines that need change. 3. What inspired you to start a website for fitness software? I started writing this software well over ten years ago around my own personal needs. I have always been analytical in my approach to everything in life. I learned long ago that if you can measure it, you can manage it. I needed to track my progress, nutrition, and measurements. I wanted to see if my size and strength were progressing or plateauing. Along the way, I discovered and brought into the software formulas that have stood the test of time, and developed new ones with some math professors. This system had become popular among my peers. After using it and making great strides, they recommended I put it on the market. 4. How does a person that is not as disciplined with their workouts benefit from this type of software? I have found that an organized, focused approach keeps you motivated and going to the fitness facility longer. When you see your progress graphed, you realize the return on your investment of work. The discipline comes with each entry as you are keeping a log of your progress. You will keep data on the date and time of each exercise, energy levels, reps, weight, body weight, and a rating. This is kept forever. I often go back years to see how far I have come. I can attest that I am stronger now than I have ever been in my life. This would have been much more difficult without our software. 5. Is there a way to try the software on a trial basis? We realize not everyone has a desire to take an analytical approach to their fitness efforts. This is why we are offering a free 30 day trial. If in 30 days, this approach isn't for you, then you have lost nothing, but may have learned a little about your training. 6. Can the software be utilized if someone already has a gym membership? Absolutely. Many of its users take their iPhone or mobile device right to the gym with them. They make entries as they conduct their workout. This allows them to see and adjust their workout immediately, getting the most out of every one. 7. What do you think is the best/most utilized feature in the software? Definitely our workout rating system. It is the only one of its kind. This system is used by personal trainers to show their clients the progress they were able to make, training under them. We have also found workout partners and groups of trainees use and compare their scores in a competitive nature. Because your body weight is one of the factors in the rating, a smaller trainee has an equal chance of obtaining a competitive rating with someone of greater size. 8. What are the benefits of your one-on-one personal trainer feature? Our one-on-one consultations are done via phone, email, or text. It is up to the trainee. They get questions answered and guidance from some of the top trainers in the country. All of our trainers are certified. Many hold records in respected fitness fields. We match our trainers with the advice needed based on the trainers skills, specialties, and certifications. This service is managed by Scott Rabine, one of the top trainers in the area for young athletes. 9. The memberships are set up for six month intervals. Why six months? We wanted to make sure the user got ample data and time to see the benefits. If you look at the average person in training, they will go to the gym roughly three times a week to work most muscle groups. This mean a single exercise would only be tracked 4 times a month. The price of this service is minimal and often replaces the cost of a personal trainer at $30 to $75 per hour. 10. Can people also buy supplements and workout equipment at your website? Yes, as stated above. One of the things we are most proud of is that World Vision has signed up as an affiliate. World Vision is the number-one organization in the world for children. 90% of all proceeds go directly to the children. When you purchase one of our products or services through their link, 20% goes directly to World Vision. The money we can provide to them has been specially "ear marked" to save the orphanages in Romania. The project is called "Changed Forever Project (Romania)." The fitness industry is a 16 billion dollar a year industry. We are privileged to have the opportunity to help such a great and needy cause.